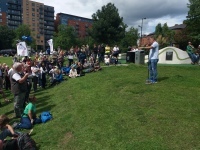 Sheffield Hen Harrier Day 2017 a huge success. 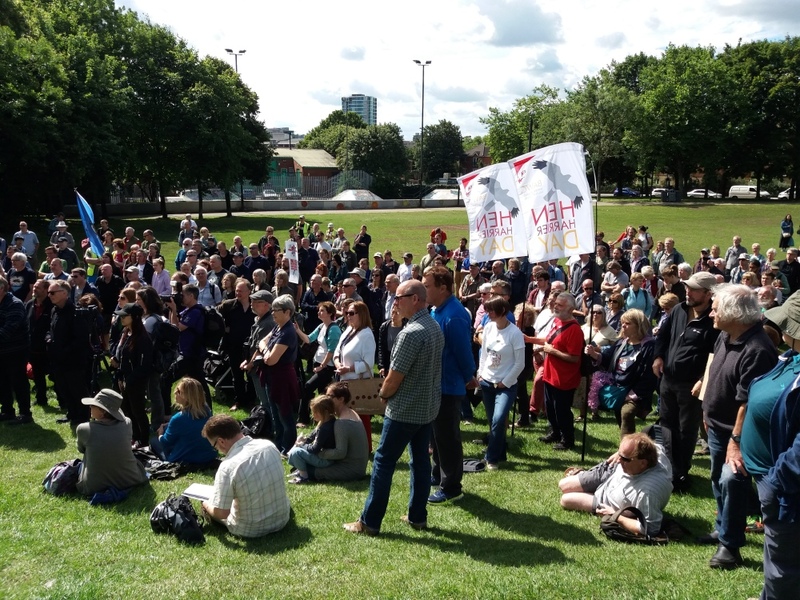 On a sunny 5th August around 350 campaigners decended on Devenshire Green in Sheffield City Centre, calling for greater protection for Hen Harriers and other persecuted birds of prey. 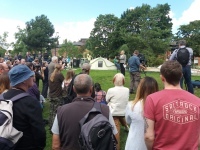 A photographer and journalist from the Sheffield Star and Telegraph took photos and notes while television crews from the BBC's Inside Out and Look North filmed for the evening bulletin and a special feature to be broadcast in September. Our PA system hired in specially for the day ensured that our message was heard across many of the city's streets which enticed passers by to pause and listen. 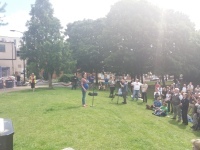 Sheffield Hen Harrier Day may not have been the largest in terms of bodies in the crowd, however it engaged people that otherwise wouldn't have known about the issues that we are passionate about. There were even times when a peregrine falcon was circling overhead. A big thank you goes out to everyone who helped to make the day a success from the marshals and speakers who gave up their free time to help make it happen to the people who were able to support us in person on the day and those who gave theirs from further afield, you all helped to get our message out there. Another thank you goes out to the Sheffield BID team within the City Council and South Yorkshire Police for allowing the event to go ahead. Also to Fox Audio Hire who's PA system that we used to broadcast our message. Our biggest thank you goes to the team at Birders Against Widlife Crime for letting us hold their event and building the foundations for this one to go ahead. 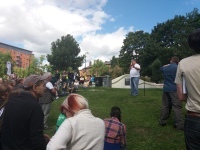 See slideshow below for the speakers addressing supporters. 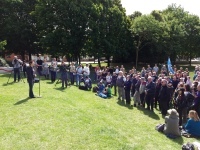 The Sheffield Star and BBC Look North reported on proceedings, with a number of bloggers talking about the action on the day too. We've put together a compilation of these reports, if we've missed any could you please let us know through our Facebook and Twitter feeds. 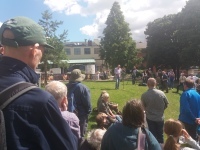 If you've seen any more blogs or articles on Sheffield Hen Harrier Day please let us know via the Facebook and Twitter pages. 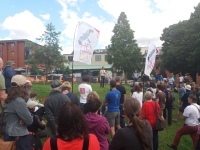 Since we began in 2015 Sheffield Environmental has been a strong supporter of Birders Against Wildlife Crime and their Recognise, Record, Report campaign and Hen Harrier Day events. Unfortunately we weren't to help boost their funds at Devonshire Green by selling merchandise or holding a collection, so below are links to their Spreadshirt shop and donations pages. BAWC is a volunteer group that is acting on behalf of a community of like-minded individuals, not just birders, but anyone who agrees with our aims. Mostly the campaign and projects have been funded ourselves, but as we have grown that is no longer possible. With the annual Hen Harrier Days, a conference and attendance at events such as Birdfair costs soon mount up. In addition we are collecting funds for fieldwork such as the satellite tagging project, and we are looking trying to get as many as our “Three Rs” leaflet into as many birds hides as possible. Donations are essential to keep BAWC flying! So how will donations be spent? We can’t say exactly what we will spend donations on because we don’t always know, but we can guarantee that it won’t be on jollies, new cars (or old ones), meals out, flash suits, meetings in golf resorts, or ‘accessories’ for an office we don’t have. We know everyone who does this sort of thing says this, but we care deeply about what we’re doing and we will treat all donations with the care and respect they deserve. They will only be used to further our work: helping all of us help tackle wildlife crime. Can we thank you for your donation? 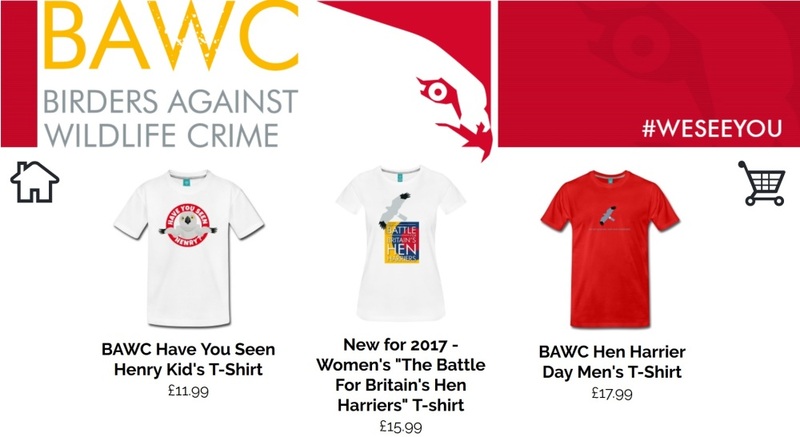 We’d like to thank anyone who donates £5.00 or more by offering them a BAWC badge – a shiny metal piece of loveliness that ably demonstrates your intolerance of wildlife crime and wildlife criminals to anyone prepared to look quite hard at your lapel! We take donations/payments through PayPal. You can use credit/debit cards etc (you don’t need to have your own PayPal account), and while there is a small charge taken from the donation by PayPal the money does go straight into BAWC’s bank account (which is at HSBC in Leeds). If you’d like to help us, please just click on the Donate button on the right hand side of this page and PayPal will do the rest. Now Hen Harrier Weekend is done and dusted for another year there are a number of things that you can do support the campaign work to give greater protection to the campaign to end illegal persecition. Joining the RSPB and or your local Wildlife Trust , isn't just about donating money on a regular basis to charity. As a member you strengthen their voice as a lobbying group in the Houses of Parliament, the stronger their voice, the more notice MPs take of them when drawing up new legislation. By giving a little time as a volunteer could support the work of the organisations working to make our part of the world a cleaner and greener place. 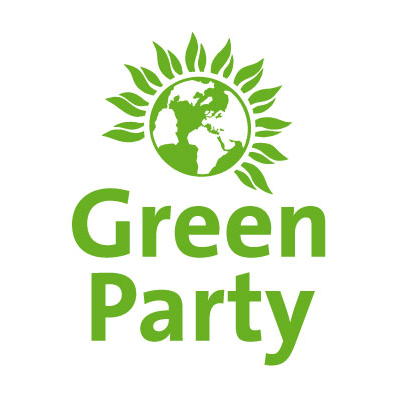 Our Get Involved page has links to a number of those who are operate within the Sheffield Region. Follow the highs and lows of the UK's Hen Harrier population with the RSPB's Skydancer project through the RSPB's webpage or Twitter Feed. The younger members of the family can complete 6 of the 15 activities to become a Hen Harrier Hero. 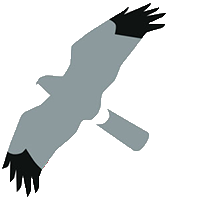 By completeing another four they can become a Hen Harrier Super Hero, take a look at the links to find out more. Contact your MP and tell them that more needs to be done to prevent the illegal killing of our birds of prey. The laws protecting our uplands and wild places need to be strengthened with tighter regulations around those who exploit them. Stay tuned for updates on Hen Harrier Day 2018. 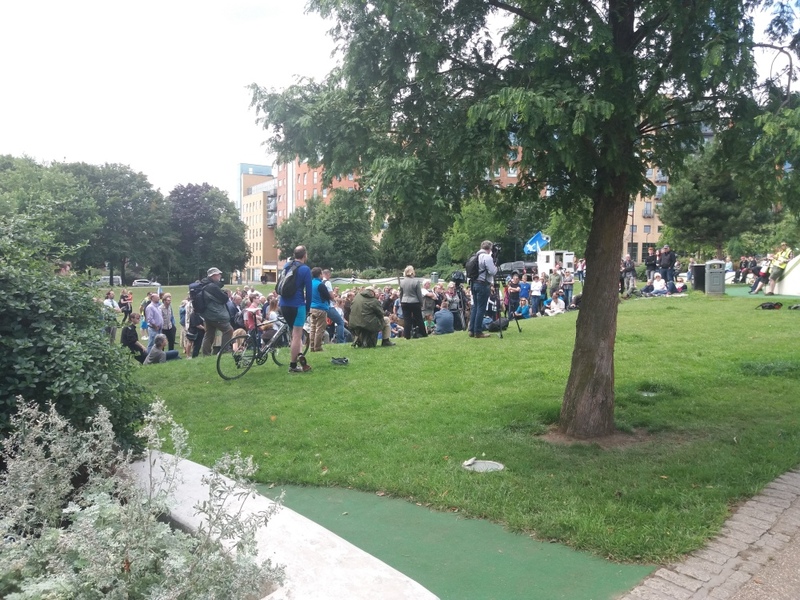 The Sheffield event is provisionally booked to return to Devonshire Green on Saturday 4th August. 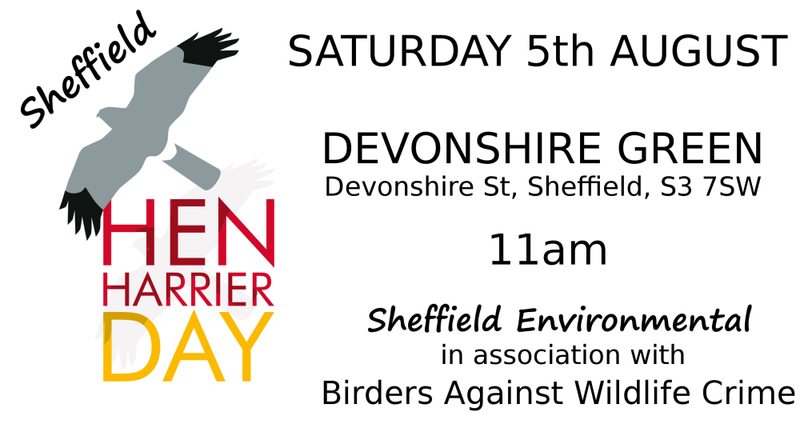 While Sheffield Hen Harrier Day was a huge success and next year we want to make it bigger and better. We are in the very early stages of planning at the moment so we wont be making any announcements for a long time. 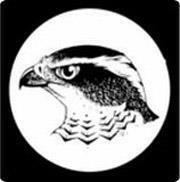 By following us on Facebook and Twitter you be sure that you're among the first to know details of the next Sheffield Hen Harrier Day. 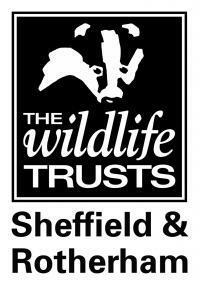 Sheffield Hen Harrier Day forms part of a series of events within Birders Against Wildlife Crime's Hen Harrier Weekend.